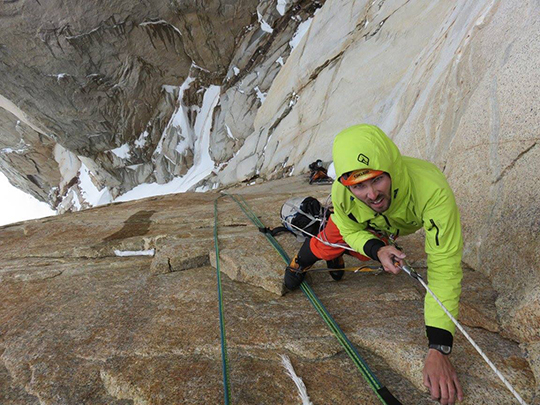 Psycho Vertical, a direttissima up the south face of Torre Egger in Argentine Patagonia, finally received a repeat ascent after almost 30 years. 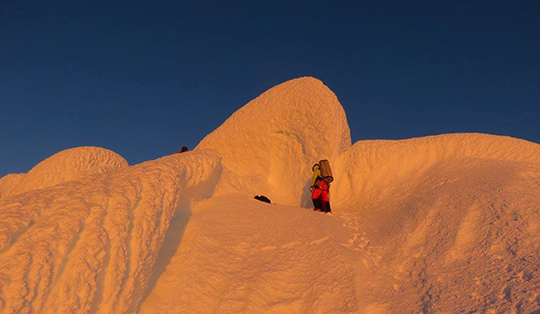 Between January 7 and 9, Italian Corrado Korra Pesce, Austrian Roland Striemitzer, and Argentines Tomy Aguilo, Inaki Coussirat and Carlitos Molina climbed the 950-meter route, despite initially arriving as two separate teams. A strong team of Slovenian alpinists, Janez Jeglic, Silvo Karo and Francek Knez, first climbed the legendary route, considered one of Patagonia's best unrepeated testpieces, in December 1986. The 2016 second ascent was done alpine style without fixed ropes or camps. The five climbers repeated Psycho Vertical (5.10b A3 M8 90 degrees, 950m) in 28 pitches, with aid placements in icy cracks and difficult mixed climbing. The team of Pesce, Striemitzer and Aguilo attempted the route during a five-day good weather window that began on January 6. The three bivouacked at Noruegos Camp below Torre Egger (2850m), meeting up with Argentine climbers Coussirat and Molina who also planned to climb the same route. On January 7, the first team began climbing, with Striemitzer leading several pitches up a steep gully. 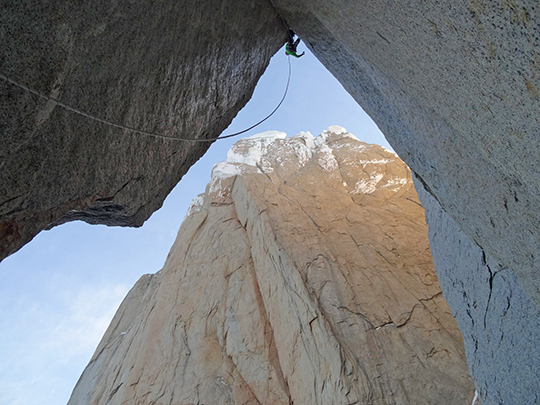 Above, Aguilo and Pesce began leading eight pitches of time-consuming aid climbing. The second team of Coussirat and Molina soon caught up and waited. Realizing that climbing in separate teams would jeopardize their ascent, and after a discussion, the first team began fixing ropes for the second climbers for the next eleven pitches. Team two led the upper section. The bivouac that night was on a two-man-wide shelf at Pitch 15 below an overhanging dihedral. While Pesce led the next pitch, the others cleared the ledge so all five climbers could squeeze onto it. That night the clouds cleared and the wind calmed. The next day the teams made quick progress up large dihedrals high on the route, reaching Torre Egger's final mushroom cap at 10 p.m. They bivied on the summit. 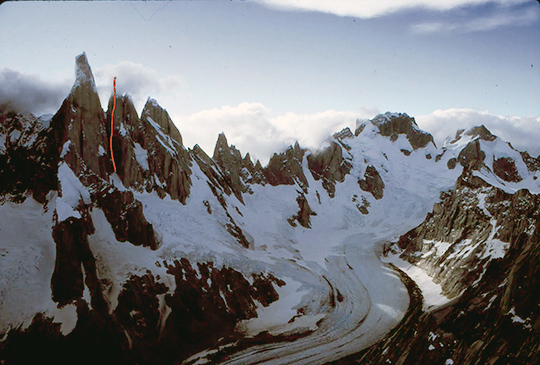 The next morning the five-man team rappelled the south face of Torre Egger, following Americana, the 1976 American first ascent route. Patagonia climbing historian Rolando Garibotti congratulated the climbers for their second ascent on his website Pataclimb.com: "A very impressive first ascent, an equally impressive second ascent, because of the style and speed in which it was done. Chapeau! [Hats off!]"